The Second US-Iraq War started by Bush/Cheney and continued by Obama now shows itself to have been a complete waste of innocent lives, American and allied soldiers, and trillions of US taxpayer dollars. What was once a stable if autocratic regime under former US-puppet Saddam Hussein is now a breeding ground for the selfsame Islamic militant types that the US government claims to oppose. Purposeless death and destruction are the ultimate fruit of the concentration of power that is the State. The State is, to the logical mind, the greatest threat to humanity that has ever existed. 1. Pallas (though conjunct Sun) is square Pluto and co-ruled by Neptune which is opposite Jupiter. 2. Venus is widely conjunct Neptune. Neptune co-rules the Second House and opposes its other co-ruler Jupiter. 3. Pluto is septile Venus and opposite her co-ruler Saturn. 4. Pluto is widely square the Sun. 5. (optional) Mercury in the First House. Mars conjunct Pluto: action plus death. Moon conjunct Uranus: severe disruption of home/land and population (Moon rules the Sixth). North Node at IC: echoes the "conservative" roots of the war. 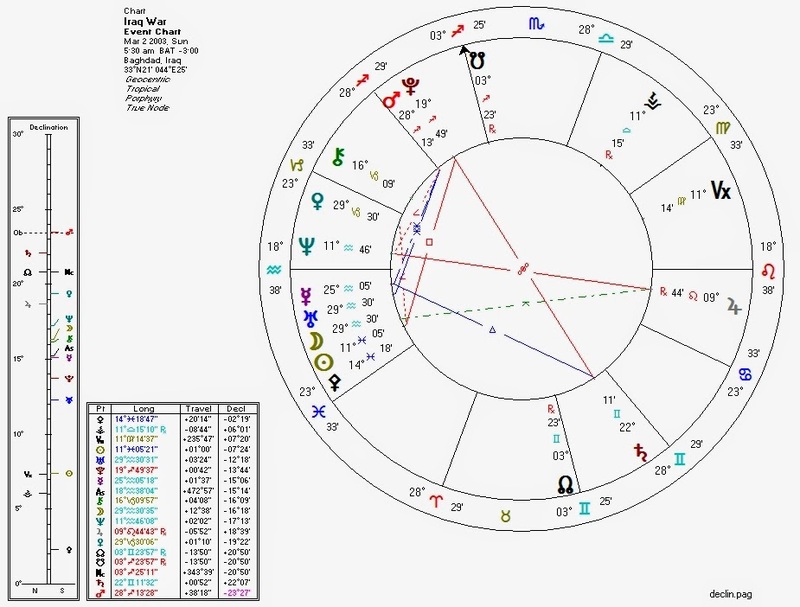 Neptune rising opposite Jupiter: reflects false (Neptune) publicity (Jupiter) about WMD, etc..
Vesta in the Eighth trine Neptune and quincunx Sun: motivated by hidden investments? Saturn opposite Mars: a long, hard slog. Mars declination out-of-bounds: an exaggerated, rogue quality to the action. 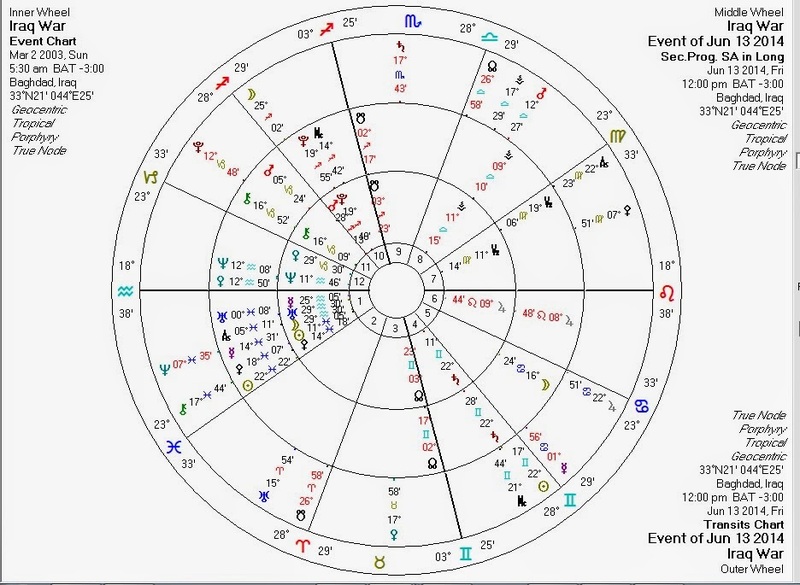 This is the same chart, with transits and progressions for the date of the news story linked above. Progressed Venus conjunct progressed Neptune: that which is of value, dissolved. Progressed Moon opposite Iraq War Chiron: injury to land/people/culture? Transiting stationary Neptune conjunct Iraq War Sun: the "heart" of the enterprise weakens or dissolves. Transiting Uranus square Iraq War Chiron: an unexpected, sharp injury? Transiting Jupiter trine progressed Sun: publicity on the war's "progress". Transiting Sun conjunct Iraq War Saturn: a spotlight on the current difficulties. Transiting Mars conjunct Iraq War Vesta: investments under attack? The true winners of the war? Perhaps American oil interests, definitely war contractors like Halliburton and Blackwater/Academi, the politicians they bribed for their insanely lucrative contracts, and the "globalist"conspirators and their Al-Qaeda pawns. We mere mortals always lose when we succumb to the schemes of the State.